Are you one of thousands of victims of an accident this year involving a tractor trailer or other commercial hauling truck? If so, you already know these accidents are more complicated than those involving regular vehicles when it comes to determining the cause. With regular vehicle accidents, the cause and responsible party, like the person who ran the red light, are usually easily identifiable. But in the case of trucks, the web of players extends beyond just the driver, making it harder to get to the cause. The individual driving the truck, often but not always an employee of the trucking company. The company which owned the truck cab or the trailer, who are not always the same. If the truck is leased, then the company who leased it from the owner is a player. Individual manufacturers of the truck parts that may or may not have caused the accident. The company who owns the truck’s cargo. So the issue of fault now goes beyond just a driver and a vehicle. With trucks, things get more complicated indeed. As with any situation where multiple companies may be held financially responsible for an accident, the companies usually immediately begin blaming one another. For example, if the accident was caused by tire failure, the owning company will try to blame the tire manufacturer, while the tire manufacturer may respond back that the company did not correctly maintain the tires. In a typical situation, where a driver is an independent driver contracted to haul the goods, the company who owns the truck will try to distance themselves from the trucker, should driver error be the cause. Driver error. Truck drivers travel hundreds of miles, sometimes with little sleep, and are therefore susceptible to accidents. Equipment malfunctions. Trucks are made of many different intricate components all manufactured separately and by different companies. Brake failures, jackknives, blown out tires, and transmission or steering failures are common equipment malfunctions. Improper securing of loads. Tractor trailers haul a variety of cargo with differing weight and shape. Failure to properly secure this cargo can result in detachment of the trailer or rollovers. Although the causes may seem straightforward, it is the various businesses involved that make it hard to resolve a truck crash. The best way to get beyond all the finger pointing and establish who is at fault for your accident, is to hire an experienced personal injury attorney. Personal injury lawyers who are familiar with trucking crashes have the understanding needed to determine fault in a truck accident – and obtain adequate compensation for its victims. 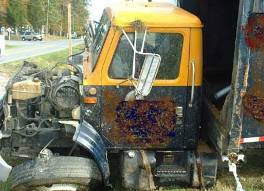 If you’ve been involved in an accident with a truck, don’t let the trucking companies run you around. Talk to a personal injury attorney about how they can sort through the legal mess, and get you compensation you need and deserve.